Cesky Krumlov — Praha hl.n. Matthias Church and Liberty Statue will appeal to history buffs. Do some cultural sightseeing at Fisherman's Bastion and St. Stephen's Basilica (Szent Istvan Bazilika). Next up on the itinerary: examine the collection at House of Terror Museum, test the waters at a local thermal spa, explore the world behind art at Hungarian National Gallery (Magyar Nemzeti Galeria), and appreciate the history behind Hősök tere. For traveler tips, other places to visit, maps, and more tourist information, read our Budapest route website . Sao Paulo, Brazil to Budapest is an approximately 18-hour flight. You can also do a combination of bus and flight. The time zone changes from Brasilia Time to Central European Time, which is usually a 4 hour difference. Plan for colder temperatures traveling from Sao Paulo in March, with highs in Budapest at 14°C and lows at 1°C. Finish your sightseeing early on the 15th (Fri) so you can travel to Krakow. Start off your visit on the 16th (Sat): examine the collection at Muzeum Historyczne Miasta Krakowa Fabryka Emalia Oskara Schindlera, take in the spiritual surroundings of St. Mary's Basilica, then contemplate the long history of Wawel Cathedral, and finally have fun at Shooting in Krakow - Cracow Shooting Academy - Strzelnica Krakow. On the 17th (Sun), you'll have a packed day of sightseeing: contemplate the long history of Wawel Royal Castle, buy something for everyone on your list at Cloth Hall (Sukiennice), and then get to know the fascinating history of Main Market Square. To see more things to do, photos, reviews, and more tourist information, read Krakow visit planner . Traveling by flight from Budapest to Krakow takes 4.5 hours. Alternatively, you can drive; or take a bus. When traveling from Budapest in March, plan for little chillier days in Krakow, with highs around 9°C, while nights are about the same with lows around 0°C. 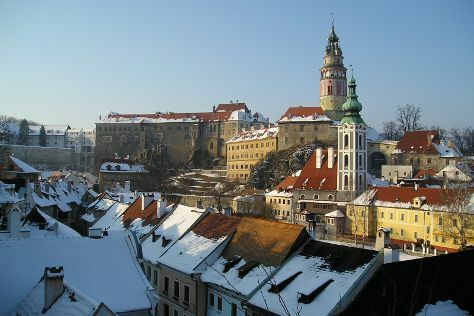 Finish your sightseeing early on the 17th (Sun) to allow enough time to drive to Cesky Krumlov. Start off your visit on the 18th (Mon): explore the historical opulence of Cesky Krumlov Castle, take in the spiritual surroundings of Klášter Zlatá Koruna, contemplate in the serene atmosphere at Zlata Koruna (Golden Crown), appreciate the extensive heritage of Historie mesta Ceský Krumlov, then pause for some serene contemplation at Christi and Our Lady of Sorrows Church, and finally steep yourself in history at Former Fink Cafe. To see ratings, where to stay, maps, and other tourist information, refer to the Cesky Krumlov attractions planner . Drive from Krakow to Cesky Krumlov in 6 hours. Alternatively, you can do a combination of flight, train, and bus; or do a combination of flight and train. In March in Cesky Krumlov, expect temperatures between 12°C during the day and 1°C at night. Wrap up your sightseeing on the 18th (Mon) to allow time to drive to Prague.